New from Hope Publishing! Prepare the Way for SATB choir and piano with optional “soulful” soloist and finger-snaps—in a gospel style your choir will thoroughly enjoy! Listen to Veni, Sancte Spiritus from OCP Publications. Now Available in Large-Print Edition! Psalm 118: Alleluia, This Is the Day! was one of three selected titles for the NPM Children's Choir Festival in St. Louis, MO and was also performed in the Southwestern Division Conference of ACDA. Singing at the Durham Art Walk. Sun. April 14, 2019 at 3:00 pm - Festival of Legends — This will be fun! Come explore the wonder and festivities. At the Optimist Farm at 2908 Optimist Farm Road in Apex, NC. Sat. 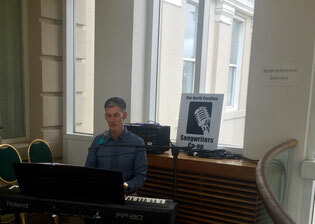 April 27, 2019 at 9:30-11:30 am - Western Wake Farmers' Market — Get your fill of fresh fruits, fresh vegetables, and fresh morning air while shopping to the sounds of my music. At 280 Town Hall Drive in Morrisville, NC. Sun. May 26, 2019 at 4:30 pm - C3 String Quartet Concert — My work, Theme & Variations on “Simple Gifts” will be premiered by Vida Strings. I am really excited how this piece turned out! Other original works by members of Carolina Contemporary Composers will also be featured. 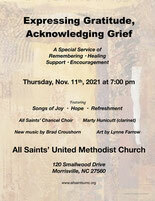 At Grace Lutheran Church, 5010 Six Forks Road in Raleigh, NC. Tickets available at Brown Paper Tickets. Week of June 10, 2019 - Composer Symposium — I heartily look forward to this event every year where I share my choral works with fellow composers and colleagues in the publishing industry. Held in Atlanta, Ga. Prepare the Way (an exciting new Advent choral piece) in the 2018 Fall release of Hope Publishing Company. In a gospel style with lots of sung dialog between voices, light percussion and a delightful piano part! 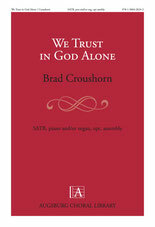 My choral hymn-anthem, We Trust in God Alone, has recently been released by Augsburg Fortress publishing (Lutheran). A setting of text by contemporary Canadian poet, James Macdonnell, it is scored for SATB choir, organ and/or piano, with optional congregation in unison. Listen and purchase here. 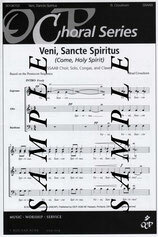 Veni, Sancte Spiritus and In Your Mercy, Lord are both now available to order from OCP (one of the largest publishers of liturgical music in the world). • With claves, congas and very accessible a cappella SAB choir parts, Veni, Sancte Spiritus hits the mark when it comes to spirited and high-energy choral anthems. • A tender song which reminds us of God's love for us, In Your Mercy, Lord is scored for piano and guitar with flute obligato. SATB refrain with descant is lush but simple, and verses are SA. Many uses for these songs throughout the year! Recent Publication — Psalm 118: Alleluia, This Is the Day! is available from MorningStar Music Publishers. From the publisher: "This anthem is fitting for almost any worship occasion, particularly throughout the Easter season. In a responsorial format, the refrain of "Alleluias" will quickly get in your ear and rouse the voices of your congregation to sound forth a stream of Alleluias!" Click on the image to hear the recording, preview the music and order it for your choral group! Sign up at the bottom of the page to learn about these pieces and all my upcoming publications and concerts as they occur! Jan. 26, 2019 - C3 Salon (house concert) — Featuring original works for solo voice with chamber choir, chime, piano, and oboe. 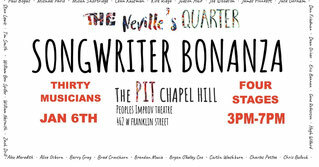 Jan. 6, 2019 - Songwriter Bonanza at The Pit, Chapel Hill — 30 musicians, 4 stages. A celebration of NC songwriters.